Jason is the son of Jupiter and Piper is the daughter of Aphrodite. Leo is the son of Hephaestus. Annabeth is the daughter of Athena. Coach Hedge is a satyr and this takes place on Long Island Sound an the Wolf House, and San Francisco. Jason wakes up in the back of a bus heading for the Grand Canyon Skywalk. he gets in trouble there and goes to a place called "Camp Half-Blood" with, apparently, a best friend named Leo, and a girlfriend named Piper. he gets a quest while the daughter of Athena, Annabeth Chase looks for her boyfriend, a guy named Percy Jackson. Read the book to find out all the details. I thought about what I'd do in Jason's situation. I would have made a lot of different decisions but generally the same idea to go solve Piper's problem and complete the quest. I would recommend this book to my smart Percy Jackson lover friends in fifth grade. It is because they would probably read it nonstop from cover to cover. I did that. I also have no doubt that they would read it in less than a week. 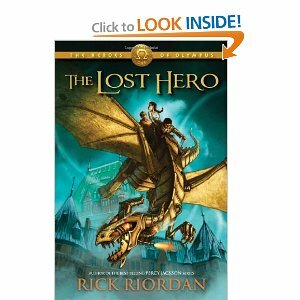 My opinion about this book is that I thought that "The Lost Hero" was AWESOME!! It was heart-thrilling, adventure-packed, and it was surprise after surprise It exceeded all my expectations.